Immerse yourself in the Ferrari world during this 6-hour tour. Test drive a real Ferrari for a full 30 minutes and leave with a DVD. Then visit both the Ferrari Museum and Enzo Ferrari Museum to learn all about the history of the car and carmaker. 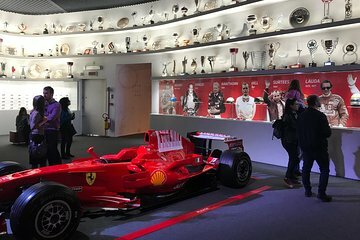 Enjoy a 4-course lunch at a local restaurant and end with a panoramic bus tour of the Fiorano circuit and Enzo Ferrari Road.